Here’s the scenario: an off-leash – or leashed dog with a careless owner – becomes aggressive and you’re on the painful receiving end of the confrontation. What do you do next? Among the many good reasons to hire a professional New Jersey dog bite lawyer to help you seek restitution, probably the best is that fewer than 1% of dog bite victims get any form of compensation for their injuries. 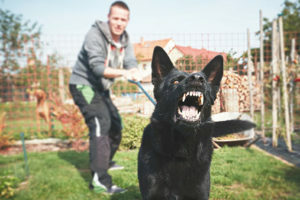 According to the American Veterinary Medical Association, each year, more than 4.5 million people in the U.S. are bitten by dogs. Almost 1 in 5 people bitten by dogs require medical attention. Every year, more than 800,000 Americans receive medical attention for dog bites; at least half of them are children. If I’m Bitten By a Dog In New Jersey, Whose In The Wrong? When you are bitten by a dog, the law is on your side. Very often, the owner of the dog is subject to strict liability, which means that you do not have to prove their negligence; it is presumed. This enables you, the victim, to be fairly compensated for your injuries. If you’re wondering “Is there a dog bite lawyer near me?” the attorneys at Birkhold & Maider can analyze your specific situation to determine if strict liability applies in your dog bite accident. We serve clients in many townships and jurisdictions across New Jersey including Newark, Belleville, Paterson, Clifton, Passaic, East Orange, Bloomfield, Nutley and other townships in Essex, Passaic, Bergen, Union, and Middlesex Counties, and beyond. Get the right representation in your corner before you face the New Jersey court system. Birkhold & Maider, LLC will be your guide through the complex legal process: A process which often will require experienced representation, whether you are protecting your profession or seeking justice for an injury you sustained. Civil litigation cases in New Jersey can often be drawn out and complicated if the parties involved lack an appropriate understanding of their rights. Having compassionate, competent representation on your side can make all the difference. Dog bite injuries sustained on the job are another area of our firm’s core personal injury competencies: We have provided legal counsel and representation for workers’ compensation cases in Essex County Superior Court, Passaic County Superior Court, Bergen County Superior Court, Union County Superior Court, Middlesex County Superior Court, and elsewhere in the state of New Jersey. Birkhold & Maider, LLC personal injury lawyers are available to represent dog bite cases in jurisdictions across the state of New Jersey including, but not limited to, Essex County Superior Court, Passaic County Superior Court, Bergen County Superior Court, Union County Superior Court, and Middlesex County Superior Court, among others. Contact us for more information on areas we serve. Knowledgeable, aggressive representation can make the difference between gaining an ability to move on with your life or carrying with you the effects of an unsuccessful case or unsatisfying result. To determine the full value of your case, we will work with outside experts to prepare as comprehensive a case as possible. Your focus should be on recovering from the trauma of the incident and the injuries that stemmed from it; we will take care of the rest. To learn more about our firm, we invite you to review our practice areas, attorney information, or contact us online for a free case evaluation. Or contact Birkhold and Maider, LLC at our physical address,189 Franklin Avenue, Suite 1, Nutley, NJ 07110, or call us at (973) 947-4670.